This is a Print-On-Demand book and is printed upon receipt of your order. It is not returnable except for product defects. Delivery will take approximately 3 weeks. This lavishly illustrated introduction to fixture design takes the reader from concept to building. It details the mechanics, materials used, commercially available components, design procedures, and economics. 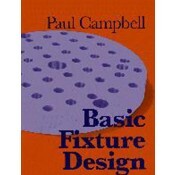 • Uses basic terms to explain fixture design. • Focuses on actual tooling procedures throughout. • Provides a full understanding of the design and application of fixture tools and checking fixtures, welding fixtures and procedures, three-dimensional space in checking compound warped surfaces, measurement systems, and the simple mathematics required.